I have a 1996 Chevrolet G30 Cargo Van to sell. No longer need. It has been a daily driver until recently. The van has a Jasper crate motor with around 40k miles on it. 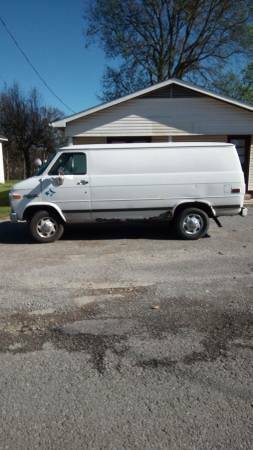 The van and Chasis have around 220k miles on it. It does not have a/c. It does run and drive but needs some TLC. There is a leaking brake hose in the front, has an oil leak somewhere, the tail pipe at the rear needs to be reattached, and there is a small gas leak from the top of the tank after it sits for a few days. Also, the rocker panel on the driver side has rusted out. It has been dependable transportation and can continue to be such. You can reach me at 931-two two seven-six two three four.